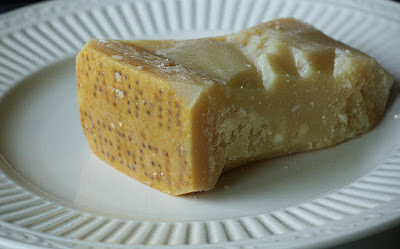 I LOOOOOVE Parmigiano Reggiano cheese!! I love the incredible smell that hits your nose when you first unwrap it from the plastic wrap it comes in. But, I do NOT love the plastic wrap!! There's no way that thin piece of plastic can keep your cheese from drying out!! What to do?? How do YOU store your Parmigiano Reggiano? With such yummy cheese, you most certainly don't want it to go bad!! Hi! I just got your comment on my blog. Thanks for coming by!We are doing an African American Infant adoption too!!! And our chances are very great that the baby may come from Georgia. We will have to look you up if we end up traveling there! My Chip In button hasn't gotten a whole lot of attention. I haven't figured out a way to promote it. What I have done though, is done quite a few blog designs and took donations for my work. It has slowed down a lot though. I am still brainstorming ideas with all of that. I usually buy it already grated in small quantities, so I just keep it stored in the deli style type dish it comes in. Hm - I guess I should probably switch it over to an airtight bag!